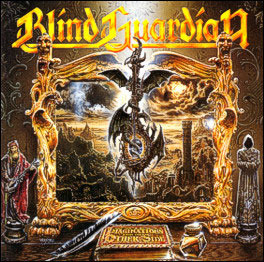 Imaginations from the Other Side is the fifth studio album by Blind Guardian that was released in 1995. The atmosphere of this album is darker in comparison to their earlier works, such as Battalions of Fear, which had a relatively happy tone. This album also marks the first since their debut in which Kai Hansen (Gamma Ray) did not guest on vocals or guitar, and the last album to feature vocalist-bassist Hansi Kürsch as bassist. It is also their first album which resulted in the release of singles, "A Past and Future Secret" and "Bright Eyes". It was remastered and re-released on 15 June 2007, with bonus tracks and videos.